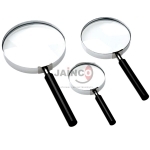 A magnifier is a device used for magnification. 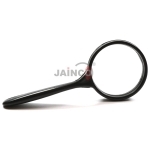 Magnifying glass, an optical device for magnification. 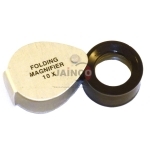 These magifier are available in all metal (metal handle and frame) or bakelite handle with metal frame or all plastic. 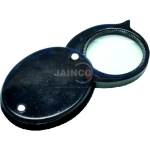 The magnifying power of those hand lenses is appropriate to be used in laboratory or reception. Magnifier with light are also available for simple use. 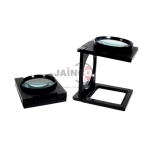 Jainco is the leading in Magnifier Equipment Exporters, Magnifier Equipment Suppliers, Magnifier Equipment in India, Magnifier Equipment Manufacturer, Magnifier Equipment Exporters in India. 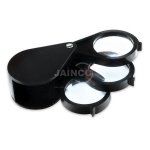 Folding magnifier with the plano-convex lens of extra white glass. Giant Magnifier. Giant magnifier with folding stand. 2X Magnification. Ideal for viewing rock specimens etc. Pocket Magnifier type in pouch dia. 40mm. Single, Diameter 40mm. Supplied with pouch. 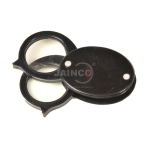 In durable plastic mount handle. In a metal frame with bakelite handle. Packed in the cardboard box. Chrome plated. In a metal frame with bakelite handle. Packed in cardboard box. Chrome plated.